We’re happy to announce we were commissioned by “Johnnie” Johnson Housing Trust! When it comes to running a housing association, there are many unique problems for which you need to find a solution. Knowing the perfect organisations to work with is something that any good housing association has to get right. For “Johnnie” Johnson Housing Trust, the solutions they needed for storage were hard to get in one place. After running through their needs with us and taking the decision to work with PODS Moving and Storage has opened up a whole new flexible solution for many unique problems. PODS, established in Manchester since 2013, makes moving and storage more affordable, flexible and convenient for customers across the Manchester and the North West. They have a range of solutions that align perfectly with the needs of housing associations. Whilst “Johnnie” Johnson Housing Trust needed its show home furniture stored and moved, PODS unique storage solutions were combined with their professional packing and removals service to provide an adaptable answer to two of their most pressing problems. Why have PODS been such a successful solution? When it comes to getting building works and renovations carried out, a housing association needs to be aware of time restrictions, delays that could require a longer storage period, and keeping within tight budgets, whilst keeping tenants or prospective tenants in mind. PODS offer a unique flexibility, providing not only storage, but also a full removals service as well. This means that the cost will be much cheaper than taking each service separately, not to mention the convenience this adds when contacting the service to extend the contract or make any changes to the service required. 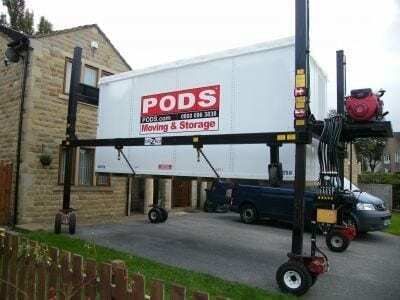 PODS – Moving and Storage work in a way that is different to other removal and storage companies in Manchester. Instead of loading a van with the items to be removed, driving it to a self-storage facility, unpacking the van, and then carrying out the whole process in reverse when the items are needed, but rather they arrive on site with a purpose built PODS container to fill. Once the container is filled, the owner of the items locks it and keeps the only key, so this takes care of the security aspect. The container is then stored on site or in the PODS Secure Storage Centre until the items are needed again, and then it’s simply delivered to the place required and unpacked on site. What was the outcome for “Johnnie” Johnson on using PODS? The solution that PODS offered to “Johnnie” Johnson Housing Trust met their needs completely. Not only did personnel not have to arrange the packing and removals themselves, but they were offered an alternative that worked flexibly according to their needs. It’s clear to see that the services PODS offer go hand in hand with Housing Association’s needs, and we hope to provide a future service to “Johnnie” Johnson Housing Trust. If you have any queries about how PODS can work for you – contact the team today on 0161 820 7003.